Chardham Yatra is a prominent and sanctified journey to the four holy shrines encompassing Yamunotri, Gangotri, Kedarnath and Badrinath. These shrines for the Hindus are situated in the Uttarakhand. Because of their huge importance among the Hindus, millions of devotees undertake this sacred journey. For the accommodation of this horde of devotees, there are many luxury camps in Chardham, providing the perfect accommodation options for the tourists. These luxury camps in Chardham offer the tourists to stay in tranquil and comfy environs. The camps en route to Chardham are the perfect places to have a relaxing stay while attaining the spirituality of the sacred journey. There are camps for Yamunotri, Gangotri, Kedarnath and Badrinath situated in the nearby places Barkot, Harsil, Guptakashi and Joshimath respectively. Camps in Barkot: Camp in Barkot is set on the road leading to Yamunotri, at a distance of 40 kilometers from Dharasu. It is a positioned at an elevation of 1829 meters above sea level. The camp in Barkot provides for a relaxing stay in rainproof tents. Barkot is a place of abundant beauty with sights of snow-capped mountains all over the place. An exceptional outlook of the everlasting snow mountaintops of the Bandarpunch can be viewed from the camps. Camps in Harsil : Camps in Harsil offer the perfect mix of modernity and tradition. It provides the peerless tranquility and lavishness to the pilgrims. Warm hospitality is the admired trait of the camps in Harsil. Set in the topographically rugged region of Uttarkashi, Harsil is well known for its natural exquisiteness and palatable apples. From this region, the audacious ones can trek to Sat Tal, which is located just above Dharali. It is 2 km beyond this spellbinding area and welcomed by the pleasing sight of seven lakes found in the midst of gorgeous natural settings. Camps in Guptakashi: Camps in Guptakashi can be found on the way to Kedarnath at an elevation of 1319 meters. These camps offer well appointed tents with all modern facilities.Like Kashi, Gupkashi holds a great significance among Hindus. The major attractions of this region are the Ardhanareshwar Mandir, Vishwanath temple and ManikarnikKund (The place where the two streams of Yamuna and Ganga rivers meet.) At Nala, a stupa is edified, quite near to Ukhimath, which is believed to be the winter seat of Kedarnath God at the time of the portals of Kedarnath being closed. Camps in Joshimath: In the camps of Joshimath a tourist can enjoy his stay amid the splendid pulchritude of nature. The camp is equipped with well appointed facilities to satisfy all.Joshimath is defined in the prehistoric scriptures as Kartikeyapura, as the Katyuri rulers termed it after their Deity, Kartikeya. This sacred region is also known as Jyotirmath. Situated at an altitude of almost 6,000 ft., it is one of the four legendary monasteries. A standard point of pilgrimage, Joshimath also acts as the base for the trek to the famed Valley of Flowers. Joshimath is near to Nanda Devi, situated at an elevation of 7816 meters. Furthermore, Joshimath is at a distance of 15 kilometers from the skiing resort of Auli. Camps on the route to Chardham no doubt provide a relaxing stay in the midst of the picturesque environs. Tourists normally do not have an adequate amount of knowledge about the camps in Chardham. Chardham camps are the typical example of supreme comfort and relaxing amenities. All the camps offer similar level of cozy stay experience. Information regarding the major amenities provided in Chardham Camps is given below. The Chardham Camps offer well-furnished tents with separate restroom and up-to-date facilities. The interiors of the accommodations have been fashioned in such a manner so that it can go with the mood of its delightful loving environs. All of the rooms are facilitated with all day round running hot and cold water. 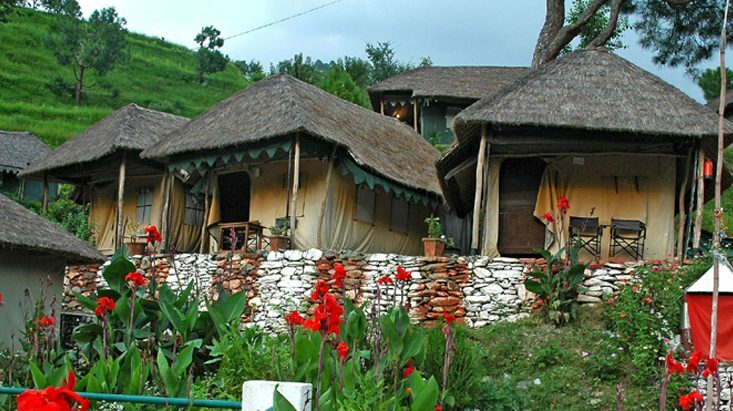 The Chardham Camp serves multi-cuisine dishes prepared from organic and fresh vegetables. The eating-place offers lip-smacking food that enhances appeal to the stay at the wonderful place. The tourists can indulge in the scrumptious food served by the skilled chefs at the camps. Well-structured activity blocks for religious discourses, Arti, etc. The camps in Chardham are situated at the most scenic resorts in the area with all the up to date facilities. Placed in the middle of tranquility of the verdant flora, a vacation in the voluminous camps in Chardham make the guests feel as if they are in a paradise. The camps are situated on the route of Chardham Yatra; hence, the tourists don’t need to travel extra to stay in these camps. In addition to that, these camps are not heavy on the pockets of the tourists as they are cheaper than the lavish hotels or lodges. The Camps in Chardham give the devotees a relaxing accommodation experience like never before. The comforting stay while sanctifying the inner self by undertaking the sacred Chardham Yatra is something that fills the devotee’s bag of experience with pleasurable memories!